A witty, easy-to-read guide that enables anyone to master one of Bach’s most beautiful preludes—in 6 weeks!—even if they’ve never touched a piano before. Acclaimed concert pianist James Rhodes has translated his genius to the page so that anyone with access to a piano and 45 spare minutes each day can master Bach’s “Prelude No. 1 in C Major” in six weeks . . . even if they have no musical experience! How to Play the Piano breaks down everything aspiring pianists need to know. Dividing Bach’s prelude from The Well-Tempered Clavier into short segments, the book teaches the basics of piano step by step—the treble and bass clefs, sharp and flat notes, how to practice—in a way that encourages personal interpretation, soothes the mind, and unleashes creativity. 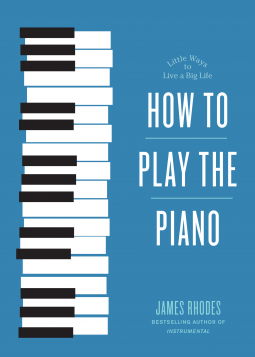 How to Play the Piano doesn’t just culminate in a reader’s ability to perform one of Bach’s most beloved masterpieces; it teaches a skill to enjoy one’s whole life long. How to Play the Piano was a delightful read on so many levels. Rhodes' commentary is witty, fun, and approachable, and his instructions are beautifully clear and concise. The first half of this book opens with general musical (and piano) know-how for absolute beginners, before breaking down the prelude bar by bar, in short easy steps. I do play the piano a little (I completed up to Grade 5 ABRSM), and I thought this guide was perfectly laid out. I love the idea of introducing someone to the instrument by teaching them a simple piece. It's a method where you get an instant result, which would be encouraging in a manner that would hopefully lead those people on to study the piano more fully. Accompanying the book are four short videos and a copy of the sheet music. My only tiny gripe was that, when the book notes where to find the videos, it gives only a main website address. It took me several minutes of searching through all the pages on the site before I found the videos and music, as it was not obvious where they would be. A note of the full direct link would make things much easier for readers.